This story as a meanful teaching for children. I got the meaning of the story or the moral of the story as you read. This is a great story for children of all ages. Parents should pick this one out and help teach our children what it mean to be different. The author does a wonderful job of this though pictures and story itself. She show how god created a world that is colorfull. Would you want your child to be colorblind? God made us to see colorfull and world colorfull so we should teach our children that being different skin color like chocolate it okay and that even siblings may look the same but different. 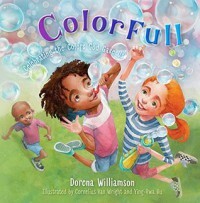 This a book teach children and others that colors are beautiful. If everything was the same color our world would be dark or not special. Look at your world differently and teach our children and child to be kind and say there a reason god made each and everything with colors. He want as to see Colorfull.